The Orono Land Trust is a local non-profit organization with an all-volunteer Board of Directors. Its function is to encourage the presence of trails and open spaces in the Orono area. Over the years the OLT has matured as an organization, paralleling the growth of the national land conservation movement. Conservation of important natural communities, habitats, and species, comprehensive stewardship of fee and easement properties, public education, and regional conservation planning all have been added to the initial interest in trails and connectivity. Before the formation of the OLT, many of the trails traversed privately owned land and were informally maintained by constant use and by intermittent spurts of pruning and blazing by users. The only trails on public land were those used by the cross-country track team on about fifty acres of Orono school property and in the UM forest. As of 2012, OLT owned 313 acres, held conservation easements on ~660 acres, and provided stewardship and some monitoring on an additional 190 acres. Trail easements for connectivity of OLT parcels are on an additional 2.8 acres. Orono now has an extensive system of trails, some trails of which have existed for at least one hundred years: strings of trails, knots of trails, trails on town and school property, trails in a wilderness park, connector trails (with permission) on private lands, or throughout the University of Maine forest, and trails on land owned by the Town of Orono and the OLT. As of 2012 Town of Orono had approximately 50 miles of trails on more than 1,700 acres of public and private land open to the public, with connecting trails across private land provided by the good will of the owners, but often codified with trail easements (see Property list). Orono Land Trust signs are placed at all trailheads, and some have kiosks. The OLT conducts workdays twice a year to maintain and improve the trails. 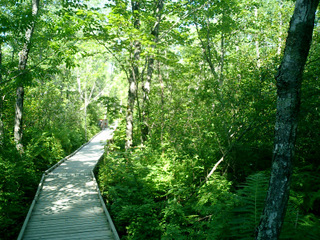 OLT monitors a vernal pool, the Stillwater River Trail, and the Caribou Bog Ski Trail. Trails are now available on 3 Veazie properties and a recent acquisition (Wickett parcel) inOldTown will have trails developed in the coming year. OLT publishes a newsletter quarterly to inform membership on the status of projects and activities, which include picnics, workshops, lectures, canoe trips, geocaching, and ski outings in addition to biannual workdays. The effort and success of the Orono Land Trust is all accomplished by dedicated, local volunteers. If you want to help then please consider volunteering and becoming an OLT member.